Eric W. MacDonald, a world leader in 3D printing and additive manufacturing whose research has garnered nearly $16 million in funding, has been named the first Morris and Phyllis Friedman Chair in Engineering at Youngstown State University. MacDonald was previously the Texas Instruments Endowed Professor and associate director of the W.M. Keck Center for 3D Innovation at the University of Texas at El Paso, where he also was director of the ASICs Laboratory and deputy editor of the Elsevier Journal of Additive Manufacturing. “Dr. MacDonald is a nationally-recognized scholar who will further strengthen and enhance the reputation of our additive manufacturing programs at YSU,” said Brett Conner, associate professor of Mechanical and Industrial Engineering and director of the Advanced Manufacturing Workforce Initiatives at YSU. In the position, MacDonald will teach engineering classes, pursue and publish research on 3D printing. He also will collaborate with local and national researchers in industry and academia to advance and promote additive manufacturing and to help develop the future workforce required to maintain economic competitiveness. MacDonald, now a part of the YSU Department of Electrical and Computer Engineering, said he has long admired the rich heritage of manufacturing in Northeastern Ohio and is excited about the opportunity to help transform the local and national economies by advancing additive manufacturing. “Having previously collaborated with professors at Youngstown State, I was motivated to join the university given the high caliber of on-going engineering research,” he said. 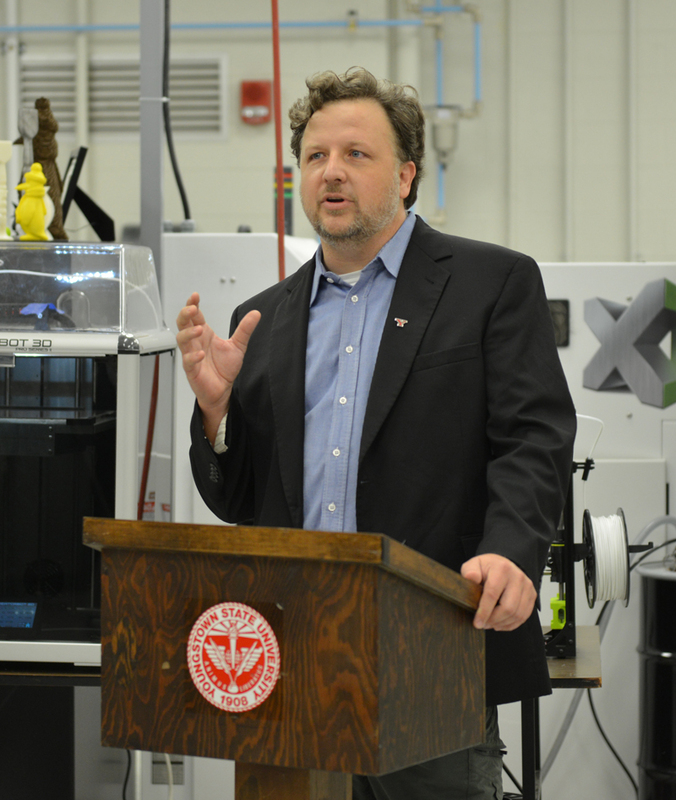 “YSU, local industry and the proximity to both the National Additive Manufacturing Innovation Institute (America Makes) and the Youngstown Business Incubator provide an ideal environment for pursuing additive manufacturing research, education and entrepreneurship. MacDonald earned bachelor’s, master’s and PhD degrees in Electrical and Computer Engineering from the University of Texas at Austin. He worked at Motorola and IBM, both in Austin, as well as co-founded a start-up acquired by a Silicon Valley firm before joining the faculty of the Department of Electrical and Computer Engineering at the University of Texas at El Paso in 2003. He served faculty fellowships at the NASA Jet Propulsion Laboratory and SPAWAR (Space and Naval Warfare Systems Command). He was a Fulbright Scholar for the state department in 2011 in Chile and was been invited back for summer 2015 with a grant from the Chilean government. He has received more than $3.8 million in research funding as principal investigator, and an additional $12 million as co-principal investigator, from funders such as Lockheed Martin Corp., the Department of Defense, NASA and the National Science Foundation. He has three patents and many other patent applications in process. One IBM patent was licensed by Sony and Toshiba. He also is the founder or co-founder of many start-up companies including Prognosticon in Las Cruces, N.M.; El Paso Instruments; and Printed Device Concepts both in El Paso. MacDonald is very active as a consultant, a member of several professional societies and has received several awards and honors. Besides editing the Elsevier Journal Additive Manufacturing, he is the author of 22 scholarly articles, 55 conference and other publications and has made invited presentations in China, Mexico, France, Chile, Korea and throughout the United States.